The visit of Prophet Abraham and Isaac and Abraham's prediction and desire to buy the Valley of Peace. Those who have visited Najaf will remember vividly that to the north and east of the town there are acres of graves and myriads of domes of various colours and at various stages of disrepair. Whoever goes to Najaf will follow a road that approaches the town by a winding course through this vast cemetery. The Prophet Abraham had come to this place along with Isaac; there had been many earthquakes in the vicinity, but while Abraham remained there, there were no tremors. On the night, however, when Abraham and Isaac went to a different village, and sure enough Najaf was visited with another earthquake. The valley that Abraham wanted to buy is called the Valley of Peace (Wadiu's-Salaam), and it is related on the authority of the fourth Imam, that Ali once said that this Valley of Peace is part of Heaven and that there is not a single one of the believers in the world, whether he dies in the east or west, but his soul will come to this Paradise to rest.2 "As there is nothing hidden in this world from my eyes," Ali went on to say, "I see all the believers seated - here in groups and talking with one another." And so as per the prediction of Abraham, Imam Ali was buried here. Ali is absent today from our midst only physically. His soul even to this day is the greatest spiritual resort everyone who seeks the help of God through his medium. Thousands and thousands of people call out to him in their difficulties, and the word "Ya Ali Madad", automatically comes to them. A famous prayer known as "NADEY ALI" (Call Ali) is recited wherever abound the lovers of Ali. "The Mausoleum itself of Hazrat Ali at Najaf, is breathtaking. There is one large central dome which stands out of a square-shaped ornate structure at the two sides of which are two minarets. The predominant colour of the exterior is gold, bright shining gold and the entire exterior of the mausoleum is inlaid with a mosaic pattern of light powder blue, white marble, gold again with an occasional splash of Middle East rust." So says D. F. Karaka after his visit to Najaf, and further adds, "I have sat and wondered at the marbled splendour of our Taj Mahal, the tomb which Shah Jahan built for his Empress Mumtaz Mahal, but despite its beauty, the Taj appears insipid in comparison with this splash of colour at Najaf. The tomb surpassed anything I have seen in gorgeous splendour. All the great kings of the world put together could not have a tomb as magnificent as this, for this is the tribute which kings and peasants have built together to enshrine the mortal remains of the great Ali." Countless number of people from all over the world flock to his tomb day after day to pay their respects and to offer salutations and to pray to Allah seeking his intercession. 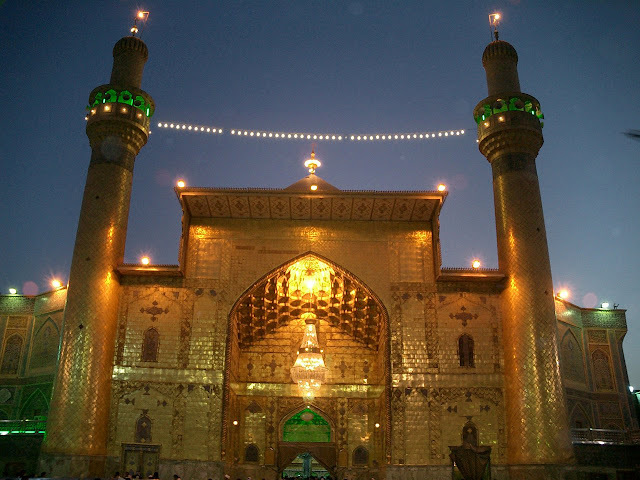 And those who cannot afford to go there personally, are constantly praying to Allah to help them to visit the shrine of their Maula Ali, and when somebody goes on a pilgrimage to Najaf, they request him to offer salutations on their behalf, and to pray to God - for some particular favour - and to seek Imam Ali's intercession. 1. Majlisi op. cit. page 108. 2. Mailisi op. cit. Page 111. 3. Majlisi op. cit. page 111. 4. The Shrine of Ali at Najaf from "The Shi'ite Religion" by Dwight M. Donaldson.